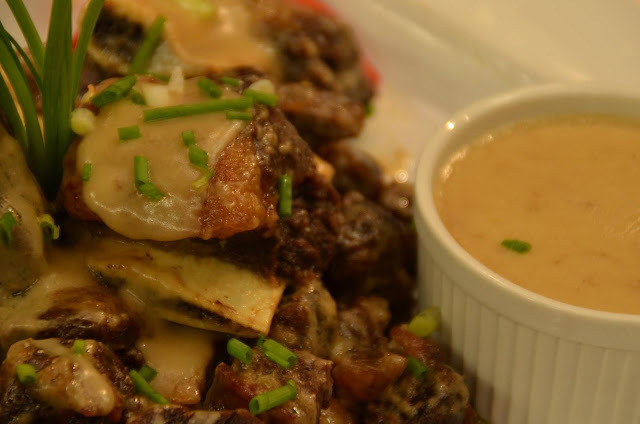 Coming next is Magic Crispy Beef Ribs with Creamy Gravy.No dad can resist the beefy morsels and oh-so-yummy goodness of this melt-in-the-mouth specialty. Crisp and creamy at the same time, Chef Boy suggests it as an offering not just for dad but for every special family occasion too. 1. Combine beef with water, onion and MAGGI OYSTER Sauce in a pressure cooker. Cook 45 minutes after the whistle blows. 2. Drain liquid from meat, reserving one fourth cup of the stock. Drain beef ribs thoroughly and let cool. 3. Fry tenderized ribs in hot oil until brown on all sides. Drain using paper towels to remove excess oil. 4. To prepare gravy, heat butter in a pan. Add flour and stir to make a roux. Thin out with reserved beef stock and season with MAGGI MAGIC SARAP. Lower heat and pour in the 'LITE CREAM. Simmer for another 2 minutes. Serve with beef ribs.